I must confess, I am a product junkie. Beauty products, to be exact. 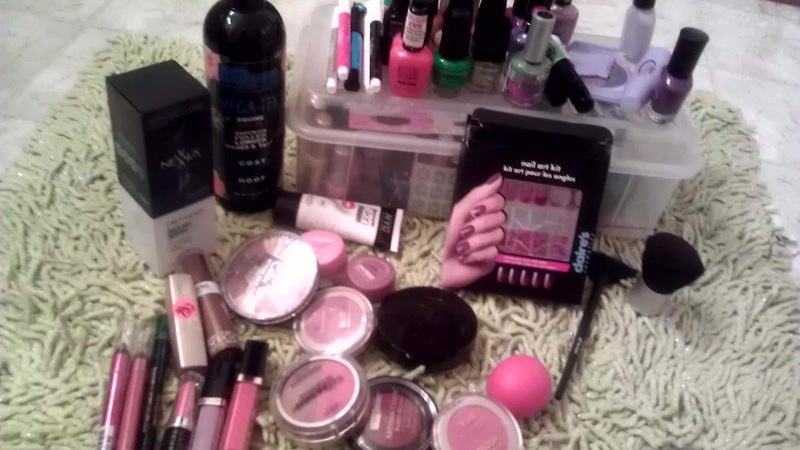 Nail polish and blush are my "drugs" of choice. I scour the shelves of local drugstores, daily in search of nail colors I don't yet have, the newest shade of blush, and most importantly, clearance/bargain goodies. 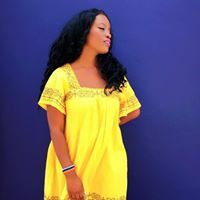 Many women scoff at the thought of purchasing such products at drugstores, but I find that drugstore brands work best for me. I have tried department store cosmetics in the past, only to be disappointed. For me, the only difference between "dimestore" and department store cosmetics is the fact that you can actually try your purchase out before purchasing at the latter. I find great pleasure in sneaking away with Noa to H-E-B, Walgreens, and CVS to find my next fix. A few weeks ago, I was on a message board, when I came across a thread stating that CVS was selling all MILANI cosmetics for 75% off. I immediately jumped off the sofa, grabbed shoes for Noa and myself and ran out the door! On that day alone, Noa and I visited 3 different CVS locations! Sadly, not ALL of the locations had the clearance special going. I think we got lucky at two out of the four stores we visited. The pictures below are showing all of the beauty products I have purchased within the last 4 weeks. You will see some Milani products-mostly blushes scattered throughout, and LOTS of nail polish. Take a look! I've been pretty busy, as you can see. The top picture is an overall view of my newest junk. My mom calls this hoarding! The second picture is a closeup of the my newest lippies. I refuse to buy anymore lip gloss anytime soon. 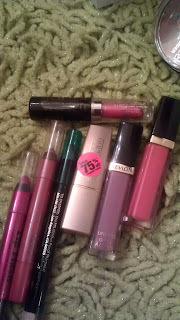 I'm progressing more into lip markers, lip "crayons" and creamy lipsticks. 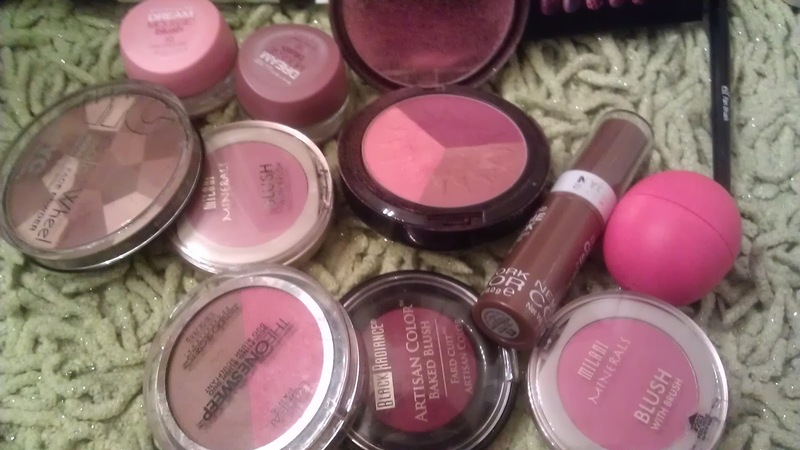 The next picture is my latest blush and powder finds. I love, love, LOVE rosy cheeks! The last picture is nail polish, nail art pens, and a nail art stamper. A few weeks ago, I happened upon a Claire's that was going out of business, and I brought lots of nail polish there, in addition to tons of earrings, bracelets, and necklaces, of course. Believe it, or not, I only spend about 3-5 dollars most of the time. How? I try to mostly nab the clearance, or discontinued items as I previously stated. 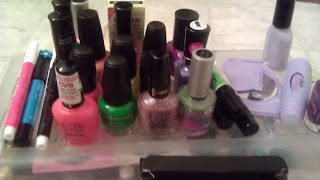 As a general rule, I NEVER spend more than $3 on polish. H-E-B is always having some type of cosmetic clearance. Just last night, I scored the two Maybelline Dream Matte Mousse blushes for $2, each. I scored the two Revlon lip glosses shown for .62 each! I'm very frugal, and I simply love a bargain.